Atmospheric CO2 if coal emissions are phased out linearly between 2010 and 2030, calculated using a version of the Bern carbon cycle model. 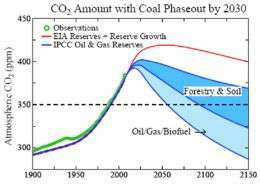 (PhysOrg.com) -- If climate disasters are to be averted, atmospheric carbon dioxide (CO2) must be reduced below the levels that already exist today, according to a study published in Open Atmospheric Science Journal by a group of 10 scientists from the United States, the United Kingdom and France. The authors, who include two Yale scientists, assert that to maintain a planet similar to that on which civilization developed, an optimum CO2 level would be less than 350 ppm — a dramatic change from most previous studies, which suggested a danger level for CO2 is likely to be 450 ppm or higher. Atmospheric CO2 is currently 385 parts per million (ppm) and is increasing by about 2 ppm each year from the burning of fossil fuels (coal, oil, and gas) and from the burning of forests. The statement is based on improved data on the Earth’s climate history and ongoing observations of change, especially in the polar regions. The authors use evidence of how the Earth responded to past changes of CO2 along with more recent patterns of climate changes to show that atmospheric CO2 has already entered a danger zone. The authors suggest that reforestation of degraded land and improved agricultural practices that retain soil carbon could lower atmospheric CO2 by as much as 50 ppm. They also dismiss the notion of “geo-engineering” solutions, noting that the price of artificially removing 50 ppm of CO2 from the air would be about $20 trillion. What proof is there for this conjecture other than GCMs whose runs project only hypothetical scenarios based upon hypothetical assumptionns? My deep religious faith in global warming denialism is not shaken by this at all. Grow more plants... easy solution. Plants only sequester carbon in so far as they build new soil; all the other CO2 is just released back to the atmosphere by the action of fungi, bacteria, mites, worms and oxidation. pfft that would never work. You can't make money off of it. Eliminate coal? America is the Saudi Arabia of coal; how convenient. Why not simply eliminate all the industry and cars in North America, then sue China and India to support us through the UN? Maybe they know something about climate, maybe they don't. The results aren't in on that one. But boy are they out to lunch when it comes to public policy. This doesn't even pass the sniff test. Go back to your labs and stop embarassing yourselves. The source of 50% of our electricity is not going to be replaced by unicorn farts. In the mean time, the earth's global temperatures have been declining for the past ten years, and have decreased to their 1970-80's levels in the past 2 years. So, since global warming has stopped, what is Hansen worried about? Other than his funding and future Nobel Prize? Looks like everyone here is a climate scientist. Has it ever occured to any one of you that the climatologists might be right and you might be stupid? If they are wrong: Thank God! But what if they are right and we do nothing! The world will survive: But not us: Maybe we should again say Thank God! Of course we have to do something. We have to take a shovel and put money six feet under and build discotheques out of the airplanes. Has it ever occured to you that when unfounded theories are forwarded they might be wrong? Have you ever figured that a scientist is a person and is just as interested in money as an oil baron? Why dont you go tell that to all other sections? Velanarris, I hope you will find your heart someday, because playing around like this with the lives of many peoples at risk, can only be done from someone who has not find is own. You know very well, but contributing to hate blogs as you do is evil. Velanarris is a caring human being. He is not evil. He thinks differently than you do. And that is a good thing. I am still unconvinced on the science of mad made global warming. But. If the figures are to be believed (and I believe them more than the conclusions) then we have been polluting the atmosphere for a long time. CO2 in the atmosphere seems to have an extremely long half life, and it is our duty to curtail our pollution of this planet. Hopefully, one day, the place can be turned into utopia. To get there though we have to start from here. Where we are at right now and the path we have taken to get here cannot be the same path we want to travel in the future, can it? It is a good plan to look at what level of pollution we want to finish at. The only task ahead then, is to determine how we are going to get there, and how long we intend to take to get there. So lets some researchers research. Let them determine the type of atmosphere we want to breath, let a debate take place. I am in favour of setting the aim at a clean atmosphere on a planet with plenty of green space, somewhere where you can get away from other people from time to time, without having to travel to Antarctica to do it. How do we develop a clean, green, stress free planet and lifestyle without having to find some way to escape from the world? I for one don't want to spend my life contemplating my navel just so I don't have to look up and see smog filled skies all around. Re RobertACookPE statement "In the mean time, the earth's global temperatures have been declining for the past ten years, and have decreased to their 1970-80's levels in the past 2 years. " Below is the link to a report and graph that show that statement to be untrue. Its worth the pro AGW (or all of us) reading the whole of that link. Isn't Ontario around LA? Where do you live? Up in the Grapevine? what if they are wrong and we do manage to drop global temperatures? Kind of a connundrum. I don't agree with this. He is constantly rejecting any argument what so ever, any, all, nothing is good enough for him. However the arguments that he comes up with are odd (like the earth quakes theory). If he would be consistant and be as critical on both side, I would think he has a heart and cares about human being, but he is very very far from that. He is 100% biased, so much that this is past common sense, it has become emotional and selfish, unkind to only want to see what is a direction against one where lives, in the end, are at play. so let me get som important facts right if we concider the 2ppm per year and the current of 385PPM versus the 350ppm ideal then we've been polluting for the past 17.5 years? Or maybe the number ramped up but even then it'd be hard to stretch back to the begining of the industrial revolution. Maybe the numbers are right and the original pre industrial number was closer to 180ppm. Then we're all screwed because we'd starve all the trees at some point plus as against acid rain as I am, a certain acidity to rainwater is neccisary for soil life. "Decreasing CO2 was the main cause of a cooling trend that began 50 million years ago, the planet being nearly ice-free until CO2 fell to 450 ± 100 ppm" plus or minus 25% are you kidding me? "there is a possibility of seeding irreversible catastrophic effects." "Equilibrium sensitivity, including slower surface albedo feedbacks, is %u223C6°C for doubled CO2 for the range of climate states between glacial conditions and ice-free Antarctica. Decreasing CO2 was the main cause of a cooling trend that began 50 million years ago, the planet being nearly ice-free until CO2 fell to 450 ± 100 ppm"
hmm, irreversably repeat previous climate changes that reversed? If we've been to 550 and didn't dy, then why is 385 a scary number now? They cite 200PPM swings, but 50PPM will kill us all? This isn't even good science fiction. So where has it been proven that man's CO2 emissions cause global warming?Where is said global warming currently, either natural or anthropogenic? Correlation does not imply causation. A studies initial assumptions determine its conclusion.Will all this ice melt quickly ,like in a year or two or will it take a Century? By the way, who says the planet is at its optimum temperature and ice levels, etc.Or were the best conditions 10 years ago? Oh, that would be 1998, it's cooler now. Or was it 1988 when Hansen had his performance in Congress? And just where is all this CO2 coming from? Does Henry's law still apply? Besides changes in CO2 levels lag temperature changes.The average Ph of the oceans is about 8.1, so just how much CO2 is needed to bring the oceans below a Ph of 7? Finally, is it true more taxpayer money is spent on "global warming" research than Cancer research? That would be a very interesting fact indeed! You do have a point. Even if we do something we might in addition have volcanoes errupting etc. On the other hand species survive if they do not overtax the eco-system. Thus if you excrete more than your surroundings can rework and renew you are bound to end up in trouble. We have lived for the past 200 years as if the world's resources are unlimited and if it can absorb all the excrement we throw at it. It definitely worries me. They are also ignoring the role played by the oceans as a sink for CO2 and a thermal reservoir. If we want to maintain levels of CO2 at lower levels than it is now it will be expensive. But, how do we know that CO2 at lower levels than now is better? For much of earths history CO2 has been higher than now. Sure the world has been getting warmer and may now be getting cooler. We are polluting the world - much of it is particulate which causes cloud cover and thus has a cooling effect. We are building cities which creates localized heating and also changes the local precipitation. We are cutting down forests and creating agriculture or suburban sprawls. These things are not fixed by concentrating on global warming. Lets solve some of the most pressing problems, most are social like starvation and disease, some are Green like deforestation, extinction. Actually, the amount of forestation in the contiguous 48 states has risen in recent decades and is now higher than it was in the 1920s. And lets not forget that Al Gore was opposed to the US Senate ratifying the Kyoto Protocol. We all should know by now that the best way to pass bad science is with great media! The most extravagant lies can be psycho-laundered by authoritative repetition by the most trusted names you know. Pretty soon the obedient masses will start repeating the mantras on cue and the people will begin to enforce the lies themselves through peer pressure and popular communication. Look how successful this was in in Germany and the USSR - at least until the massive backlog of reality burst through the psychobabble dams they built. ok so now the argument becomes whether or not global warming is real. Hum , I was raised in the east of England and in the summers of the '60s and early '70s if the temperature got to 80F we were shocked such things were unusual. when last in London in the summer of '99 we had several days of 100F temperatures up to 104F. Sorry ,to me that is kind of convincing to a layman that maybe global warming is real. In high school in the '60s were discussed the possible results of releasing in a couple of hundred years the carbon laid down over millions from fossil fuels. global warming through the greenhouse effects was one of the theories proposed. There are many historical periods in the past 1500 years that indicate large climate swings, both warm and cold. None of these events were precipitated by any human activity, humans simply accepted them as part of nature and adapted. Climate change is real, it will forever be a part of the human experience and the best way to approach it is with calm, rational, intelligent adaptation. I suspect what offends most people is the strain to impose a sense of immediate crisis and emergency upon a phenomenon that is quite natural and has been ongoing forever. Further negativity is generated when certain interest groups try to hijack the social response to climate change and force it to their own ideologies and political aspirations. Szkeptik - how come all this "not a climatologist so stfu" doesn't apply to Al Gore? RAL - Al Gore is the other end of the spectrum. He's overreacting for his own political reasons. I do think it's good to frighten the population a bit so they take it more seriously, but on the scientific level I don't think Al Gore has any grounds to argue on. It's not terrorism to tell the people about the worst possible outcome. If there is a real possibility of it happening, than it's merely stating facts. "But when those facts are false..."
Please don't start with that. Climate change is not like astrology. The specialists in that field all agree that it's happening. I also don't think that the Earth ending up looking like Venus is a probable outcome, but as long as the possibility is there, however remote everyone has the right to know that their grandchildren just might get roasted because of them. Please do some googleing about methane in the ocean floors. I was reading about some scholars that died of Malaria they got from mosquitoes breeding in the Thams River in London. This was several hundred years ago and the climate has still not warmed back up to that level yet. But it may happen soon. And if it does will it have anything to do with Man produced CO2?